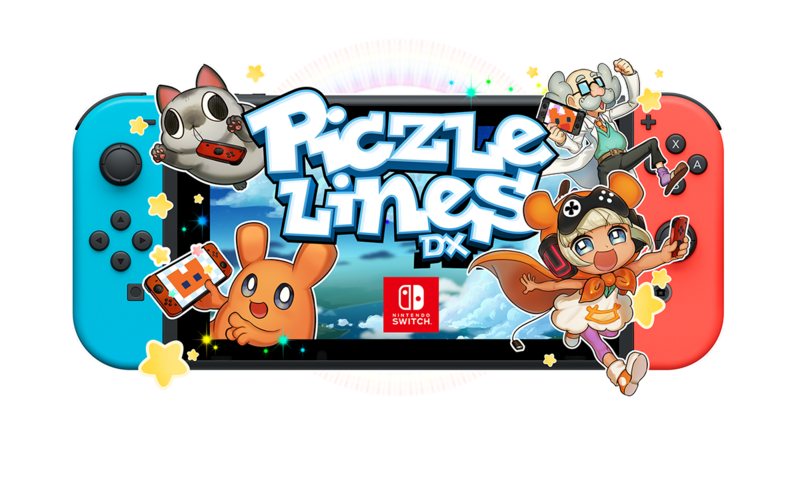 Piczle Lines DX released yesterday on the Nintendo Switch eShop. If you enjoy puzzle games with a lot of content, then you'll want to check this review out! I picked a pack of Piczle-d puzzles. Plenty of mobile games on smartphones and tablets have found their way on to the Nintendo Switch eShop recently. The majority were executed quite well. I can now add Piczle Lines DX to that list as well. With some similarities to Picross and online games like Pic-a-Pix, Piczle Lines DX adds some of its own originality into the puzzle genre while including heaps of content to keep players busy. The rules of Piczle Lines DX are relatively simple. 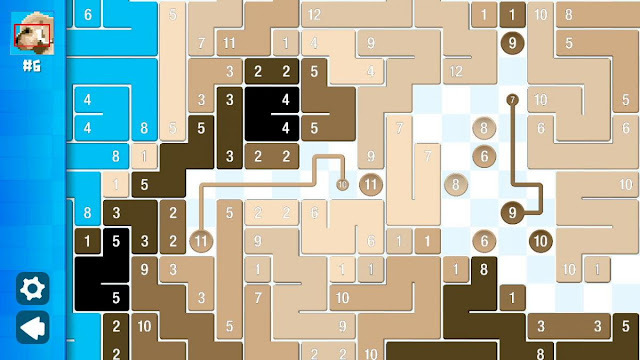 You begin with a square grid which at the easiest puzzles starts at 16 x 16 while later puzzles increase the size and complexity by up to 128 x 128. A series of numbers are sprinkled about the grid. Your goal is to connect similar numbers and the same color as one another to create a final image. Hmm... This looks like quite the meaty puzzle! Oh, no wonder! The end result is a savory and delicious hamburger! It may seem basic at first--and that's because it is--but the greater of size the puzzles become with higher numbers to contend with, you have to plan much more accordingly. It's generally not a good idea to take on the highest numbers first, as it's all too easy to create a blockade between other needed connections of numbers. Therefore, starting off with the 2s, 3s, and 4s is best recommended, as those numbers generally have similar line patterns to draw, especially the 2s which are always right next to one another. By creating a baseline of the easiest to solve numbers, you can then move on to higher numbers before finally tackling double digit numbers. Who's a cute pixelated puppy? Why, you are! Yes, you are! Piczle Lines DX contains two major modes--Story and Puzzle. Story mode puts you as the young daughter of a professor. The professor just invented a contraption that can turns everyday objects into 8-bit wonders a la pixel art. Barely being able to contain herself, the daughter accidentally breaks the device, turning every object in the game's five worlds into pixels. Thus, you need to solve 20 puzzles in each of the five worlds, in a linear order, to return the objects back from their pixelated selves into tangible objects once again. Story mode eases you into Piczle Lines DX by introducing easy enough puzzles, taking but a minute or two tops. As you progress, the puzzles become more complex, complicated, and requiring more time and thought. This is unlike Puzzle mode which thrusts you directly into the puzzle-solving action. Here, you choose whichever puzzle category and puzzle you want. The simple Sports category has the smallest and simplest puzzles to solve while categories like Dinosaurs offer the largest puzzle sizes in the entire game, taking a huge chunk of one's time to complete. Have your brain jump right into the puzzle-solving fun with the Puzzle mode. In total, between the Story and Puzzle modes, 320 individual puzzles of various sizes to solve. The original Piczle Lines released on mobile devices as a free-to-play game with an extremely limited amount of puzzles. While the Switch version requires a $14.99 price of entry, you're actually getting all of the costly DLC from the mobile version that would add up to the Switch price of the game. That includes future DLC that will be free for Switch owners (unlike the mobile original), so that makes the price difference between versions much more understandable and a bigger deal. The issue, though, is that, for me, even with all of its puzzles, Piczle Lines DX becomes quickly repetitive. Yes, the puzzles do get harder, but this is more because the square sizes blow up exponentially. It merely makes each puzzle take immensely larger amounts of time to complete them--some of which up to an hour or so. If I'm already unable to really enjoy the game for long periods of time with smaller puzzles, then why would I want to move on to puzzles with a greater size? One thing that doesn't come with a caveat is the control of Piczle Lines DX. Offering Joycon options or the ability to use the touch screen to connect lines, either way of play delivers solid control. You can even combine the two in undocked mode if you like to connect lines while panning around the puzzle with the left Joycon. Of course, you can do this with swiping at the sides of the Switch screen to move the camera around, as well as zoom in and out by pinching the touch screen, much like you would on a mobile device. Piczle Lines DX also has a solid enough presentation. Story mode brings up comic book-like panels at the start and end of each world, and when pixel puzzles are solved, the objects get brought to life in the current world "hub" of sorts. Square grids are beaming with color, and it's always a joy to see all of your work on a puzzle turn into a beautiful 8-bit piece of pixel art. Unfortunately, with regards to the music, there is really just a couple of tracks of note, and both are similar to one another, merely adding more accompaniment. Hearing the same song over and over again while attempting to solve puzzle after puzzle in the game only added to my previously mentioned feeling of repetition with the game. For its limited faults and mild occasions of repetition felt, overall, Piczle Lines DX's gameplay basics are premise are enough to bring plenty of joy to the game. With no pressure in the form of timers or ability to fail puzzles, Piczle Lines DX is a game that brought me a nice form a relaxation and lovely feeling of comfort. It's a game that won't push your mind over the edge into frustration, nor will it come across as a waste of money when you reap the rewards regarding all of the content Piczle Lines DX has with its 320 unique puzzles. Review code provided by Rainy Frog.